Karen Burmese refugee and 'Bridge Program' graduate, Muriel Valles (23), has left Sydney following her 5-month exchange with the University of Wollngong. After some days with Karen friends in Perth, she will fly to Hong Kong on Jan 01. 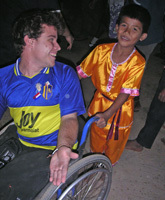 Muriel graduated from Australian Catholic University's Thai-Burma online program in 2015, and afterwards was awarded a scholarship to the Hong Kong Institute of Education. 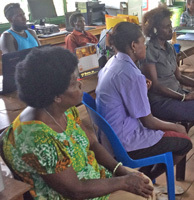 She will soon be leading the newly-established Bridge Program Coordinating Team. Bon voyage, Muriel ! 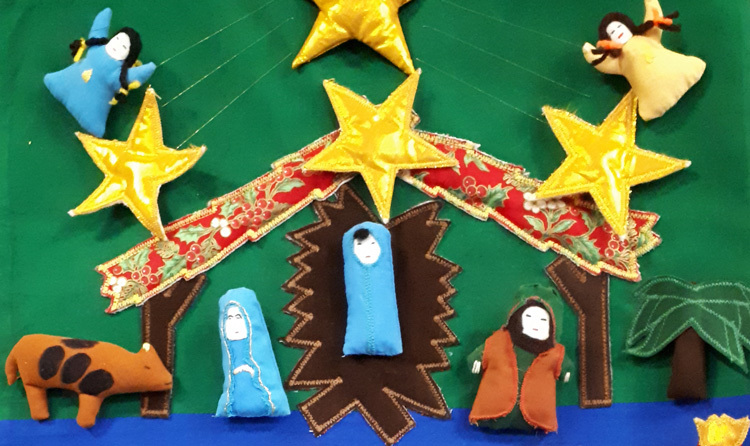 Some are expecting the Christ-Child soon; some have anticipated the happy event. Pick the cribs, then click here. 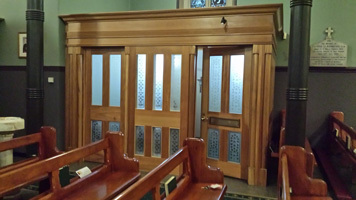 A newly-renovated Reconciliation Room greets Advent penitents at St Patrick's city centre shrine, Church Hill, Sydney. 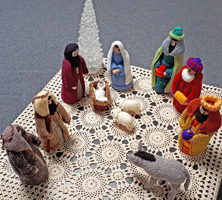 Parish priest, Fr Michael Whelan SM, reports that weekly numbers swell to about nine hundred during the pre-Christmas weeks. 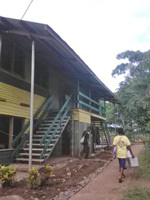 Funds from the Marist Mission Centre helped develop facilities at the school of Kanosia, PNG. 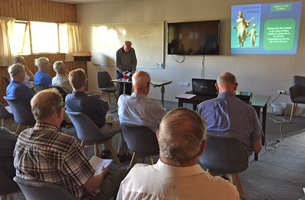 Fr Xavier Sarmian SM reports on the Oceania Marist website. Click here. 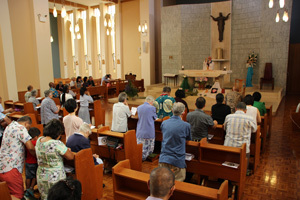 While visiting Japan for the Tsurumai Day Nursery anniversary (see November news) Fr Paul Glynn is giving a series of retreats to local Catholics. This weekend saw him at the historic town of Uji, south of Kyoto, known for its shrines and temples. The 10th-century Ujigami Shrine is said to be Japan’s oldest Shinto shrine. Uji is also famous for its green tea and traditional tea ceremonies. 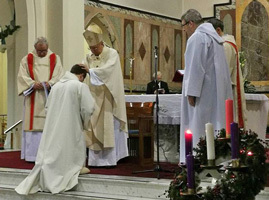 In a ceremony at St Therese parish, Donore Ave, Dublin, on Dec 09, Dutch Marist seminarian, Tom Kouijzer, was ordained to the diaconate by Archbishop Diarmuid Martin. 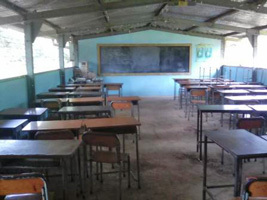 Tom is presently engaged in a pastoral placement in Ireland having studied at the Marist International Theologate, Rome, in recent years. 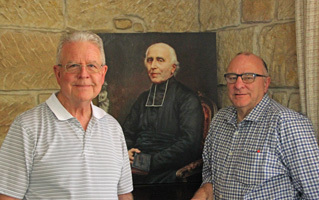 Author of the definitive biography of Marist Founder, Ven Jean-Claude Colin, Fr Justin Taylor SM, met on Dec 08 with Adelaide-based ATF publisher, Hilary Regan. 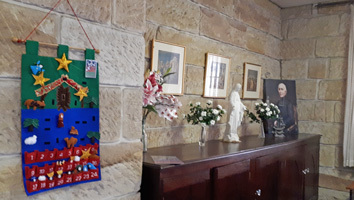 The day-long meeting at Villa Maria, Hunters Hill, focussed on illustration of the 900-page work as well as editing and distribution details. The biography is likely to be published in mid-2018. 'Statements and Decisions' of the 2017 General Chapter of the Society of Mary is now downloadable from the 'Members only' page of this web site. 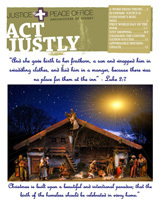 Printed copies will soon be distributed to Marists worldwide. From Rome comes the news that the Vatican Press Office has announced the appointment by Pope Francis of Fr Paul Martin SM as bishop of the diocese of Christchurch, N.Z. 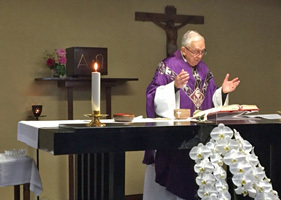 Fr Paul is currently the General Bursar of the Society of Mary in Rome. 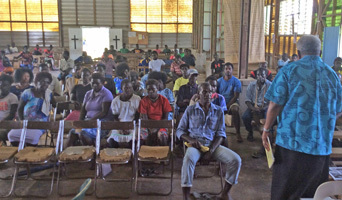 Assisted by the Marist Mission Centre, Australia, a Suva-based team has recently established the Pioneer Total Abstinence Association in Bougainville, PNG. 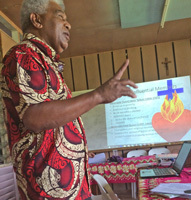 Addressing important social and health issues, Pioneer educators, Romanu Tikotikoca (pictured, left) and Paolo Lala held training sessions in several Bougainville centres. 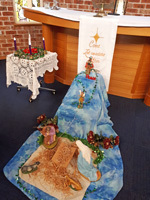 For their report, and captions, see the Oceania Marist web site: click here. 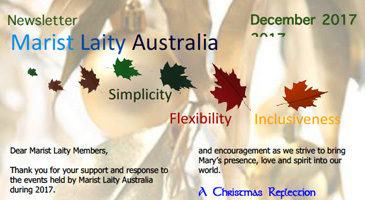 From the Justice & Peace Office of Sydney Archdiocese. Click here. 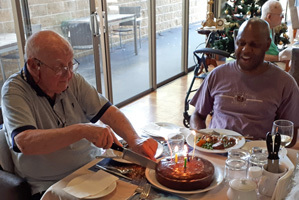 There were candles and cake for Fr Jim Esler SM at Montbel Aged Care facility on Dec 03. 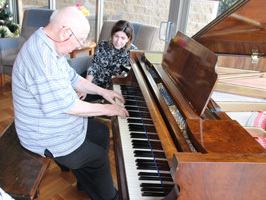 Despite some visual and aural impairment, Fr Jim is an alert and cheery presence at Montbel, and the most senior jazz pianist* in the community (* click here) and the oldest Marist priest in Australia, second in age in the province to Br Colin Campbell SM. Happy birthday, Fr Jim ! 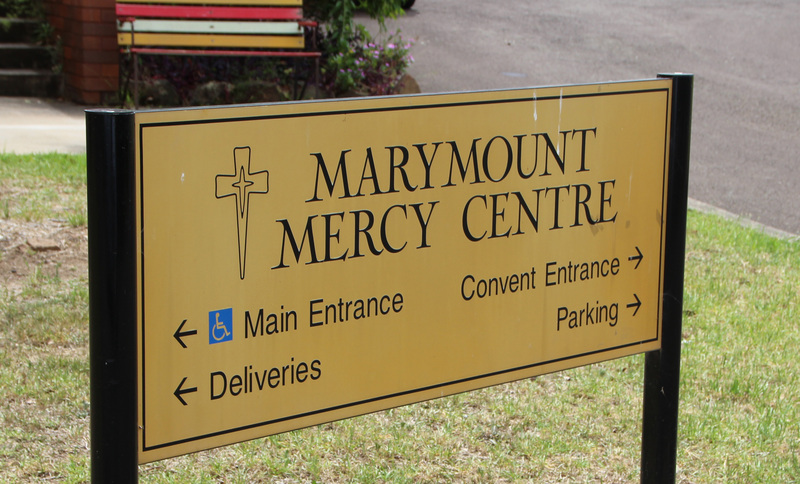 Filipino, Fr Arnold Garferio SM, was one of four Marists completing the 'New Life' program at Marymount Centre, Castle Hill, NSW. 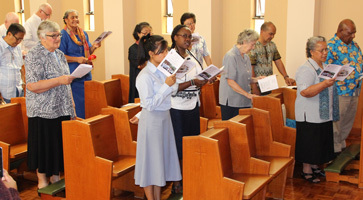 A Mass and luncheon on Dec 02 marked the completion of the course, attended by religious and priests from Thailand, PNG, Kenya, Philippines, Fiji, Tonga, Samoa, Malaysia, Korea and Australia. 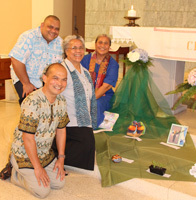 Other Marist participants (pictured left) were SMSM Srs Nanasi Tautalanoa and Sosefina Stowersand Br Luke Fong. 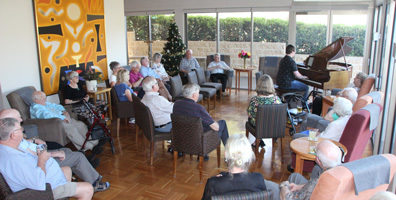 Residents and friends of the Marist Aged Care faclity, Montbel, Hunters Hill, were entertained on Dec 01 with an afternoon of piano music and songs. 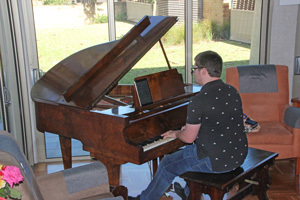 Sam McFadden, 3rd-yr student in music at Western Sydney University, regaled senior Marists with melodies of Cole Porter, Bert Bacharach and Christmas carols, before Fr Jim Esler took to the keyboard of Montbel's baby grand. Thank you, Sam -- and come again. 'Cheers from across the Tasman. We are coming to the end of the second Marist Retreat. It's at Tatum Park, near Wellington. Finishes this Friday. There are twenty-three retreatants.